We’d love your help. Let us know what’s wrong with this preview of Willie's Redneck Time Machine by John Luke Robertson. In this volum In this four-book juvenile fiction series featuring the popular Robertson family of Duck Commander and written by Phil's grandson John Luke Robertson (with Travis Thrasher), readers are invited to participate in the zany fun of the Duck Commander world. After a few chapters, readers can choose to go down different paths--all filled with humor and life lessons. To ask other readers questions about Willie's Redneck Time Machine, please sign up. I raced through this book quite quickly. I went back and read more of the story lines so I ended up reading almost the whole book. This is a wonderful first book from John Luke Robertson and I look forward to reading the other three in the be your own duck commander series. the book was funny and the storylines kept me interested and wanting to read more. Sometimes, you just need book candy. This was the perfect book for that! Since its target audience seems to be middle grade boys, it was simplistic in its style and big on humor and action. The best parts were the metafiction bits when the book acknowledged not only that it was a book, but that it was a specific type of a book. Such as, when faced with a decision on what to do next, the narrator says, “Just give me the next page numbers.” And the conversation about licensing issues with a myster Sometimes, you just need book candy. This was the perfect book for that! Since its target audience seems to be middle grade boys, it was simplistic in its style and big on humor and action. The best parts were the metafiction bits when the book acknowledged not only that it was a book, but that it was a specific type of a book. Such as, when faced with a decision on what to do next, the narrator says, “Just give me the next page numbers.” And the conversation about licensing issues with a mysterious figure who only could have been Obi-Wan Kenobi on the planet Tatooine was hysterical. It also had healthy portions of everything that makes the Robertson family who they are - faith, family, and ducks. It was really fun, even if it was nothing spectacular. I haven’t read a choose your own adventure book in ages! I’m glad not every book is this format, but it’s always a fun way to shake things up. I kept a note page with numbers written on it and crossed them off as I went so I would know when I completed the whole thing, which was kind of an extra step that added a bit more stress to reading than I like. But that’s probably just because I’m compulsive about these things. And besides, I couldn’t have it count toward my challenge goal for this year if I hadn’t knowingly completed it! I will definitely be picking up the other three books in this series at some point, but probably after I’ve been able to recover and read a few “start at the beginning and finish at the end” type of books first! I’m hoping that this book, which is the first book in a new choose-your-own-adventure series called Be Your Own Duck Commander, will catch the interest of my reluctant reader to read on her own. She really loved the choices and the adventures!! In this book you (as Willie) discover an out-house which is actually a time machine in the Duck Commander warehouse. However, it might take you a while to figure that out, because you’re sure your brother Jase is playing a joke on you! Then…depending on your choices…you…well, I don’t want to give too much away, but John Luke is always involved! We are really looking forward to the rest of the series: Phil & the Ghost of Camp Ch-Yo-Ca, Sin in Space, and Jase & the Deadliest Hunt! Disclosure: I received a complimentary copy of this book from Tyndale House Publishers. It was not required that I give a positive review, but to solely express my own thoughts and opinions. I absolutely loved this book! Though I have never actually watched Duck Dynasty (we don’t have cable! Give me a break! ), I have seen enough plush toys and pillows to know who they are ;-) I was curious as to how good this book would be, and I was very impressed. I love the kind of books that you get to choose what the characters does, because there seems to be endless books within the one! I spent about two hours sitting on my bed laughing and reading all of the possibilities that could happen ( I absolutely loved this book! Though I have never actually watched Duck Dynasty (we don’t have cable! Give me a break! ), I have seen enough plush toys and pillows to know who they are ;-) I was curious as to how good this book would be, and I was very impressed. I love the kind of books that you get to choose what the characters does, because there seems to be endless books within the one! I spent about two hours sitting on my bed laughing and reading all of the possibilities that could happen (possibly because I picture my dad doing all of the things that happened…….). THINGS TO TAKE INTO CONSIDERATION FOR YOUNGER CHILDREN: Because the Time Machine looks like an outhouse, their are a few bathroom comments but no cussing. I give Willie’s Redneck Time Machine 5 out of 5 stars for an enjoyable read and an entertaining two hours! John Luke Robertson of Duck Dynasty fame has teamed up with Travis Thrasher to create a 4 book series of choose your own adventure books. In Willie's Redneck Time Machine, Willie and John Luke discover a mysterious outhouse in the middle of the Duck Commander warehouse. They quickly discover it is actually a time machine! They are transported back to the '80s to Korie & Willie's prom. As you (or your kids) go through this book they will answer questions to decide the fate of the characters. John Luke Robertson of Duck Dynasty fame has teamed up with Travis Thrasher to create a 4 book series of choose your own adventure books. In Willie's Redneck Time Machine, Willie and John Luke discover a mysterious outhouse in the middle of the Duck Commander warehouse. They quickly discover it is actually a time machine! They are transported back to the '80s to Korie & Willie's prom. As you (or your kids) go through this book they will answer questions to decide the fate of the characters. As you flip back and forth you will be creating an adventure. One of the things my 9 yr old loved the most was that she could re-read the book, make different choices, and create a whole new story! This fun book is just as fun for the family as the popular Duck Dynasty shows! Incorporating the Robertson family just adds a whole new level of familiarity to the story. I see these books being a big hit for Christmas! I was totally expecting this to be lame, to tell the truth. I've seen all of one, maybe two, episodes of the show. I'm sure if you love the show, you'd be a lot more into this, but honestly, this could have used fictional characters and still be just as fun. I didn't realize when I started that this is a choose-your-own-adventure. I haven't seen one of those books since my childhood! The book started out super basic, and, well, yeah, kinda lame. Exactly what I was expecting. But then, it was choo I was totally expecting this to be lame, to tell the truth. I've seen all of one, maybe two, episodes of the show. I'm sure if you love the show, you'd be a lot more into this, but honestly, this could have used fictional characters and still be just as fun. I didn't realize when I started that this is a choose-your-own-adventure. I haven't seen one of those books since my childhood! The book started out super basic, and, well, yeah, kinda lame. Exactly what I was expecting. But then, it was choose your own adventure! That quickly turned this into a riot. I imagine I'll eventually end up with the whole series. This is one time the Kindle is actually a great format for the book. No turning to a particular page and possibly seeing something you shouldn't in the meanwhile - you just click the option you want and you're there as fast as a page turn! I don't know if I can actually check "Read" as my status. But, I spent a long time going from one adventure to another. Would love to add this book to my family's collection to continue the fun! You're your own duck commander. This was enjoyable but if you're an adult looking for something to read than you may want to skip this since it was mostly written for kids. Aside from that, there are many different twists and turns as you navigate the story to your liking with multiple choices and endings. All in all....it is clean and recommended for any young Duck Commander fan. Spiritual Content- A mention of a Church play; Older John Luke (in 2038) said he found a girl who loves the Lord & that God has been good to them; One Time Travel was in the Bible days of Noah (so lots of that); Mentions of Joseph, Moses, Jesus & Trusting God; In “A Note from John Luke Robertson” at the very end of the book, John Luke talks about God and quotes James 1:14. Negative Content- Minor cussing including: a ‘dumb’, a ‘dummy’, a ‘sissy’, a ‘stupid’, two ‘shut up’s, and four ‘idiot’s; a Mention that people were cursing (not written); The time machine looks like an outhouse (so there’s a mention of that, your bladder, when they go in to the “Time Machine”, John Luke comments that “it doesn’t look used, no po*p on the seat.”. Phil later comments that “a man doesn’t go into an outhouse unless he’s got business to take care of.”); Mentions of a Port-A-Potty and a Port-A-Po*ps (Ew. Just Ew. ); piles of poo; a Mention of a f*rt bomb and a bomb that smells like a pig’s gut; a Mention of holding a dead deer’s beating heart; a Mention of a wedgie; Bloody noses, slaps, fighting and most ending end with Willie/You being hit or dying. *Note: Many celebrities (Britney Spears, Rick Astley, Jimmy Kimmel, Psy (& his song, Gangnam Style), Bell Biv DeVoe, Jon Bon Jovi, ZZ Top, Spock, Godzilla, and Chewbacca), Songs, TV Shows & Movies(America’s Funniest Home Videos, Star Trek, Doctor Who, Survivor, Lord of the Rings, Groundhog Day, The H*nger G*mes, Back to the Future, Blade Runner, The Terminator, and The Matrix) plus Twitter and Radio-Shack are all mention once or many times. Throughout the book you go to: Today, Tomorrow, ??? ?, 1863, 1963, 1990, 2038, 2319, and “A Long, Long, Long Time ago.”. I reviewed this book for girls who like to hunt (like one of the sweet girls I babysit, love you S!). Now, my family (okay, really just my Dad & older sister…my Mama doesn’t like their mouths (“cr*p” is said a lot in the show which is a huge no-no in our house) and I’m iffy and don’t agree with everything they say. Though I love Mia! She’s a doll! :) ) watches the show with the Robertson family and the opening pages of “Willie’s Redneck Time Machine” seriously sounded like Willie and they way he talks. This was the first time I had reviewed a “choose your own adventure” book. (Challenging but fun.) Most of the endings ended kind of randomly though. *I received this book for free from the Publisher (Tyndale) for this review. disclaimer: I received the following book for free from Tyndale in exchange for my honest opinions. All opinions remain my own. Willie Robertson and his family formed a company called "Duck Commander" that produces duck calls and then later starred on a television series titled "Duck Dynasty" based on their everyday lives running the duck call business. Willie's son ,John Luke Robertson, decided to make his own contribution to the family's fame by writing a series of books that allow the readers to be one of the Robertson's and choose how the story will end. The books in his series are "Willie's Redneck Time Machine", "Phil & the Ghost of Camp Ch-Yo-Ca", "Si in Space", and "Jase & the Deadliest Hunt". "Willie's Redneck Time Machine" gives you a chance to play the role of Willie. It is Korie's (your wife) birthday and you are trying to figure out what kind of gift to get her when you realize that there is an outhouse in the middle of the Duck Commander warehouse. Or is it an outhouse?...it has antennas on it. Your son, John Luke shows up while you are inspecting the outhouse. He steps inside and disappears. This is where you get to make your first of many decisions in the book. Some will take you back in time to your high school prom, some will take you to the future, and yet others will take you way, way back in time. Mommy in PA: I was so excited to see that this was a book written by a Robertson. My family loves watching "Duck Dynasty". I was even more excited to see that it was a book that allows you to choose which path to take. I used to read books like these all the time when I was a teenager and was disappointed to see that there aren't really any books made like that for today's youth. This was a great book to read with my nine year old. He had a blast choosing which path to take in the story. He did a great job choosing the right path for Willie. And even if you do choose wrong the outcomes are never scary, so perfect for all ages. I love that it was something we could read over and over again but never get stuck with the same ending. They do a wonderful job at helping teach the kiddos how to choose between good and bad decisions. Good ones typically end up with good results, whereas bad ones can make you end up wishing you would have made a better choice. QUICK HIT - With its entertaining characters, hilarious dialogue, crazy situations, and overall goofy fun, I can guarantee that this is gonna be a bestseller. That’s a fact, Jack. The Duck Commander people have done a lot of weird things in the years they’ve been on television, whether it’s the goofy kind of weird (like the show in general) or the serious kind of weird (like standing up for their Christian beliefs and value). But Willie’s Redneck Time Machine, written by John Luke Robertson and T QUICK HIT - With its entertaining characters, hilarious dialogue, crazy situations, and overall goofy fun, I can guarantee that this is gonna be a bestseller. That’s a fact, Jack. Willie's Redneck Time Machine is an interactive adventure book written for children and teenagers, but I enjoyed reading it too. My eight year old son was very excited to receive this book and has been reading it every day since we got it. He has chosen four different adventures so far and really gets into them. He wrote a reading response for school on this book and said, "It was so silly, it made me dizzy." I'm not sure exactly what that means, but he liked it. My son is reading above his grad Willie's Redneck Time Machine is an interactive adventure book written for children and teenagers, but I enjoyed reading it too. My eight year old son was very excited to receive this book and has been reading it every day since we got it. He has chosen four different adventures so far and really gets into them. He wrote a reading response for school on this book and said, "It was so silly, it made me dizzy." I'm not sure exactly what that means, but he liked it. My son is reading above his grade level, so this book is probably written for middle school aged children. I asked him if there were any words he didn't know, and he said "mullet", but he figured out that it was a hairstyle based on the context clues. Willie's Redneck Time Machine is the first book in John Luke Robertson's series of interactive adventures. The others are Phil & the Ghost of Camp Ch-Yo-Ca, Si in Space, and Jase & the Deadliest Hunt. In each book, the reader gets to be one of the Duck Commander crew and make decisions every few pages that lead to the next part of your adventure. It took me about thirty minutes to complete an adventure, so this would make an excellent read for someone who has a shorter attention span, doesn't want to get into a thick book, or just wants to be entertained for a little while. I thought the adventure I chose was a little silly, but I can see how boys would love it. There were several references to how Willie was raised that reinforce what we are trying to teach our children--show respect for your elders, do not hit out of anger, stand up for what you believe in, fight for your family, show compassion for others, etc. I love how they incorporated respect and manners in this humorous adventure. It's no secret, I'm not a huge fan of the Duck Dynasty franchise (it's everywhere!) but I thought that I had better see what all the fuss is about. I'm a public librarian and some of the most frequently requested items are the Duck Dynasty books, memoirs, cookbooks, DVDs, etc. If all my patrons are into it, than maybe it's time I see what the hype is about. I might as well start small so I decided to go with a kid's book. "Willie's Redneck Time Machine" is one of four "Be Your Own Duck Commander It's no secret, I'm not a huge fan of the Duck Dynasty franchise (it's everywhere!) but I thought that I had better see what all the fuss is about. I'm a public librarian and some of the most frequently requested items are the Duck Dynasty books, memoirs, cookbooks, DVDs, etc. If all my patrons are into it, than maybe it's time I see what the hype is about. I might as well start small so I decided to go with a kid's book. "Willie's Redneck Time Machine" is one of four "Be Your Own Duck Commander" titles, there are also: "Phil & the Ghost of Camp Ch-Yo-Ca," "Sin in Space," and "Jase & the Deadliest Hunt" in the series. I was pleasantly surprised when I realized that this was a choose your own adventure book! The reader plays the part of Willie Jess Robertson (This book caters mainly to boys, obviously. The only women mentioned are not strong adventurous women like the MEN of the family, but hey, whatever floats their boats!) who discovers an odd looking outhouse in the shop. Readers will laugh out loud as they get to decide what to do at the end of each chapter. Should they go in the outhouse? How far back in time should they travel? Should they listen to their belly and go to dinner instead? Unlike the original "Choose Your Own Adventure" books, there is no dying in this series so need to worry about scaring kids. If something "bad" happens (think dinosaurs), Willie just wakes back up in the shop. No harm done. This book series is perfect for little boys (poop jokes, dinosaurs, hunting, etc.) and fans of the Duck Dynasty franchise. It's clean (except for poop jokes) and perfectly sensible for little kids. No death, no guns (except to kill adorable little ducks), no scandalous behavior. I received this book for free from Tyndale Press in return for my honest, unbiased opinion. I'm sure that all of my readers know who the Robertson Family is. Just to jog your memory think Duck Dynasty on A&E... Willie, Jase, Phil, Jep, Miss Kay and of course Uncle Si! There are many products, supplies and books out there from the famous Robertson clan... but now there are chapter books just for children! These books are written by Willie's son, John Luke Robertson (along with Travis Thrasher). There are four books in the series: Willie's Redneck Time Machine (this is the book we we I'm sure that all of my readers know who the Robertson Family is. Just to jog your memory think Duck Dynasty on A&E... Willie, Jase, Phil, Jep, Miss Kay and of course Uncle Si! There are many products, supplies and books out there from the famous Robertson clan... but now there are chapter books just for children! These books are written by Willie's son, John Luke Robertson (along with Travis Thrasher). There are four books in the series: Willie's Redneck Time Machine (this is the book we were given to review), Phil & The Ghost Of Camp Ch-Yo-Ca, Sin in Space, Jase & the Deadliest Hunt. I have two boys, Aidan and Noah (ages 7 & 8) and after we received the book I started reading it aloud to them. They love watching the Robertson Family so they were familiar with the characters in the book. In Willie's Redneck Time Machine, you are Willie Robertson (CEO of Duck Commander). You find a mysterious outhouse in the warehouse of Duck Commander. Before you know it you are on a journey through time and space in the outhouse time machine. You follow your son John Luke to a nineties prom, getting lost in Biblical times and even fight a futuristic war in the year 2319. This book is a choose-your-own adventure book.. you get to pick from a list of questions to see where you go next. Such as:: Do you get inside and close the door to see what happens? Go to page 15. Do you stay outside and call Korie? Go to page 55. With your children being able to choose what Willie does next it helps them to feel like they are living the adventure themselves! My boys love this book. I love reading this book to them! They have already put the other three books on their Christmas list for this year! I have never watched Duck Dynasty, but my kids do and when my daughter saw this book up for review she insisted I get it. We own pretty much every type of choose your own adventure book there is out there so this was one more to add to our growing collection. I adore books like this. They let your children lead, open their imagination, and learn about consequences through the decision the make for each character. They are always fun and enjoyable and can be read numerous times with different end I have never watched Duck Dynasty, but my kids do and when my daughter saw this book up for review she insisted I get it. We own pretty much every type of choose your own adventure book there is out there so this was one more to add to our growing collection. I adore books like this. They let your children lead, open their imagination, and learn about consequences through the decision the make for each character. They are always fun and enjoyable and can be read numerous times with different endings. So you basically feel like you get several books just by purchasing one. This is the fourth book in this series and in it we are taken on a wonderful adventure with the use of a magic outhouse time machine! Yep, you read correctly-a outhouse time machine. My kids thought this was disgusting and hysterical at the same time which led to some ...... imaginative outhouse discussions before we ever began reading the book. This book takes us to places we would love to go, back into time during the days of Noah all the way through the 80's and even into future wars. I know the book is aimed at kids 8-12, but my 15 year old daughter and 19 year old son also both really enjoyed it as did not 8 year old. These are timeless books that people of all ages can get a laugh out of and escape to a different time and place and relieve some of your own fond memories. What I love most about books like this are the discussions they can open up with your family. Easy series to recommend to all ages. "Willie's Redneck Time Machine" is book 1 in the "Be Your Own Duck Commander" series by John Luke Robertson (Author) and Travis Thrasher. The other books in the series (there are 4 total) are: "Phil & the Ghost of Camp Ch-Yo-Ca", "Si Soars into Space", and "Jase & the Deadliest Hunt". The recommended age for this series is ages 8-12 years old. There are 249 pages in this book. "I have never read "Willie's Redneck Time Machine" is book 1 in the "Be Your Own Duck Commander" series by John Luke Robertson (Author) and Travis Thrasher. "I have never read or seen duck commander. If you like duck commander, then you’ll probably love this book. Me personally, I didn't really like them. It’s a fun book that you can pick your own ending though. It does have a little bit of language (words like dumb, stupid, shut up) which I didn't like because we don't talk like that at my house. I thought Willie was cool." Even though my son didn't care for this book, I know alot of kids would love to read their own Duck Commander Book! "Willy's Redneck Time Machine" is written by John Luke Robertson and Travis Thrasher and is the first book in the "Be your own Duck Commander series", which is published by Tyndale House publishers. As you travel through time you visit Noah's ark, the future, high school, and plenty of varied places. With a mysterious outhouse as your transportation you and John Luke travel through time, although you are still learning the rules of time travel. At first, you think it might be a prank, but the w "Willy's Redneck Time Machine" is written by John Luke Robertson and Travis Thrasher and is the first book in the "Be your own Duck Commander series", which is published by Tyndale House publishers. As you travel through time you visit Noah's ark, the future, high school, and plenty of varied places. With a mysterious outhouse as your transportation you and John Luke travel through time, although you are still learning the rules of time travel. At first, you think it might be a prank, but the whole book is comprised of decisions for you to make, and to see what happens as a result. You experience danger, adventure, and what it is like to be a duck commander. Honestly, I enjoyed this book very much. It is full of excitement. Based on the context of "Willie's Redneck time Machine", I would recommend this book to grades 3rd-7th and ages 6-11 even though it really would be enjoyable to practically anyone who likes this genre of book series. 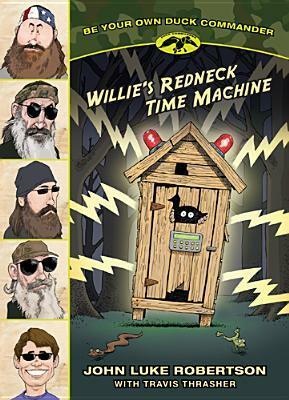 Willie's Redneck Time Machine is one of the books in a four book series by Willie's son, John Luke Robertson. "I LOVE my Duck Dynsty book. I really liked the story about John Luke time traveling to Willie's prom. I love Willie's Redneck Time Machine is one of the books in a four book series by Willie's son, John Luke Robertson. "I LOVE my Duck Dynsty book. I really liked the story about John Luke time traveling to Willie's prom. I love how he really got into telling the story. It was almost as if he was really there! I'm so glad I read this book." This is a book co-authored by John Luke Robertson, "Willie's Redneck Time Machine". In this book you are Willie. So you get to call the shots. You get to enter a time machine and have a different adventure every time you read this book if you want! I have to say that while this really is a good book for my 4th grader- it was not so much the book for me. But that had nothing to do with the story or the writing. I am not the person who likes to flip around in a book to read a story. I want to star This is a book co-authored by John Luke Robertson, "Willie's Redneck Time Machine". In this book you are Willie. So you get to call the shots. You get to enter a time machine and have a different adventure every time you read this book if you want! I have to say that while this really is a good book for my 4th grader- it was not so much the book for me. But that had nothing to do with the story or the writing. I am not the person who likes to flip around in a book to read a story. I want to start on page one and read straight through. My 4th grader on the other hand loved that part of the book. He liked being in control of the story and flipping all through the book. This book is also part of a series. The titles in the series are: Willie's Redneck Time Machine, Phil & the Ghost of Camp Ch-Yo-Ca, Sin in Space, Jase & the Deadliest Hunt. YAY! It’s a Choose Your Own Adventure Book! What I liked: I loved the CYOA books when I was a middle-grader and couldn’t help but to enjoy this one as well. I enjoyed several of the stories and had a lot of fun choosing different directions and winding up in all sorts of eras and situations. What I didn’t like: I didn’t love that the book seemed to be talking at me but my son read it and that didn’t seem to bother him at all. I also felt a bit out of place. This is definitely a boy book, written fo YAY! It’s a Choose Your Own Adventure Book! I also felt a bit out of place. This is definitely a boy book, written for boys. It speaks to them not only about what it’s like to be a man but how to treat others. Quirky. Choose Your Own adventure style drove me crazy, because I had to work really hard to figure out whether or not I had completed the book yet. However, I can see the draw to this style. Very poorly written, but so amusing, I actually did not care about the quality of the writing. I loved this book. Our family read this book as a family over several days. We loved that you could choose where you were going to go in the story. I liked that we could read one book several times and have a different story. It was a really cute and fun book, but after a while I got a little bored. It is fun to see what happens to you. I love how they made it that you are the main character. It is very creative. I would recommend it. Very cute! This book is fun! I really enjoyed how you get to pick what happens in the story. And you can go back and do it over and change what happens so it's a completely different story.